I have a 3 MFT/3 setup and while they're kinda level with each other I'd like something better and I started looking at them more closely. There's a slot on the bottom of the side profiles of each table that doesn't get used by anything. 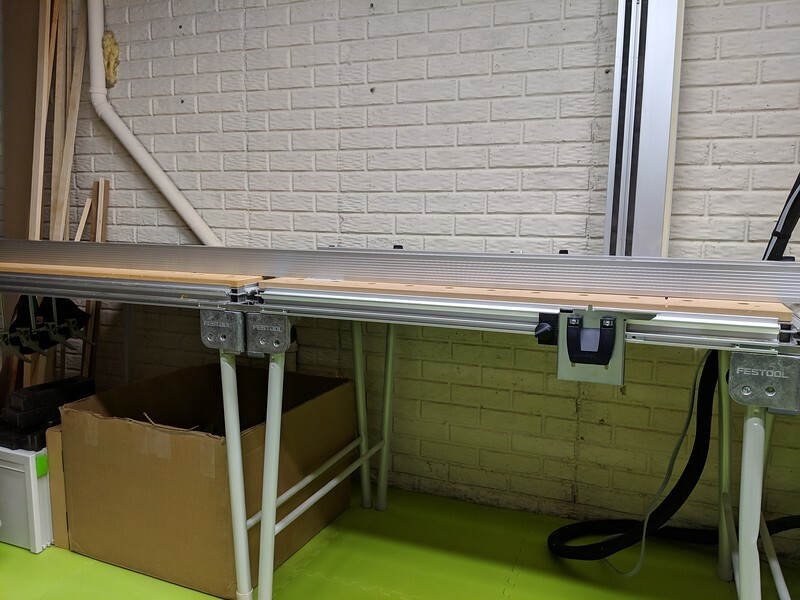 Is this some sort of standard size and could I purchase either one single long length of aluminum ~8ft long to fit in that slot to force my tables level to each other? It isn't a standard t-slot it's more like a square shape. Don't the rail connectors fit that slot? 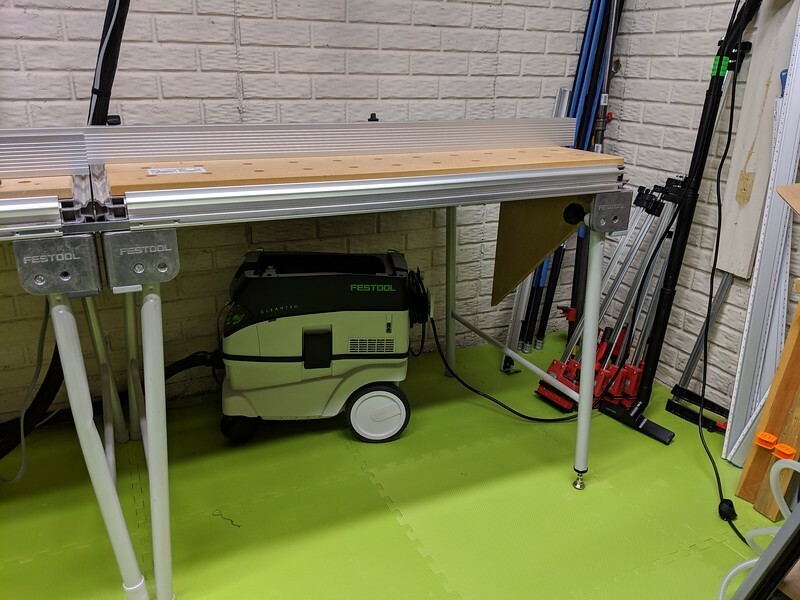 I can't remember when I last fitted two MFT's together but when I did I think I used the Festool rail connectors which I think will slide in and if you lock one side and the slide in the other table you can level and lock them up. This is from memory though, a little unsure of what I used at the old shop but I think that's how I hooked up a pair of MFT 3's. I don't have the Festool rail connectors to try, but they'd be too short for what I'm after. The MFT/3 table connectors are beefier and longer but do not fit this slot and still too short for what I'm after. If I could source something to fit snug in this slot that is long and straight I'd be able to perfectly (or almost perfectly) 'lock' the 3 MFT/3's to the same height without taking up any of the profile that might get used for other tasks. The problem with the table connectors is they make the portion of two adjoining tables mostly level but the far ends of the two joined tables are not. The adjustable feet on the MFT tables aren't good at helping here either. Sloppy adjustment and it only gets it close and doesn't hold well. @TSO Products Since you're dabbling in rail connectors already, how about making something up for me? I'm envisioning a product that fits this slot and is about the length of the distance from half of one MFT/3 to another MFT/3 butted against it. The slot is accessible underneath away from the legs so set screws could be accessed/used as well. Then one could join any number of MFT/3's together in a row using 2x of these extra long table joiners in a near perfect level arrangement. Ok, I see what you are after. But what is your end goal with having three MFT 3's in perfect alignment? If you have a perfectly level floor it is somewhat achievable. If you don't I am not sure any thin steel or other material of that length would add enough stability on their own to provide a perfect levelling of the tables or that the end result would be a rigid enough solution to warrant that extra effort unless the fit of that long joining piece is pretty darn snug. Maybe a length of one MFT plus two thirds (one third into each of the adjacent tables) would suffice? Re-read your post and I sort of get what you are after. If would still suggest levelling the floor (if possible) as a starting point. Perhaps you should look into something other than joining MFT's for a near perfect level work surface. The adjustable feet on the MFT tables aren't good at helping here either. Sloppy adjustment and it only gets it close and doesn't hold well. They are pretty awful. 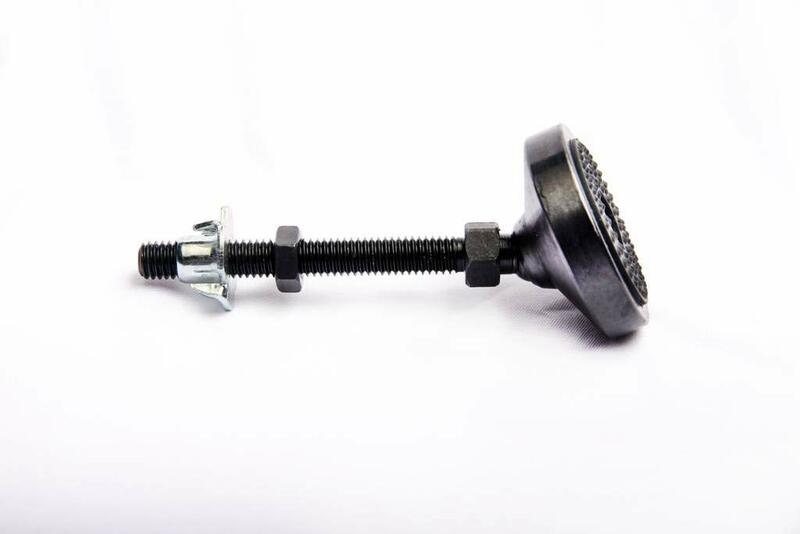 A third party adjustable screw based foot that could be used on the MFT and CMS-VL would be awsome! DynaGlide: maybe you could use the crossbraces for the MFT as well to help stiffen them up a bit and help alignment? I don't think that what you want to do will what you want it to do. 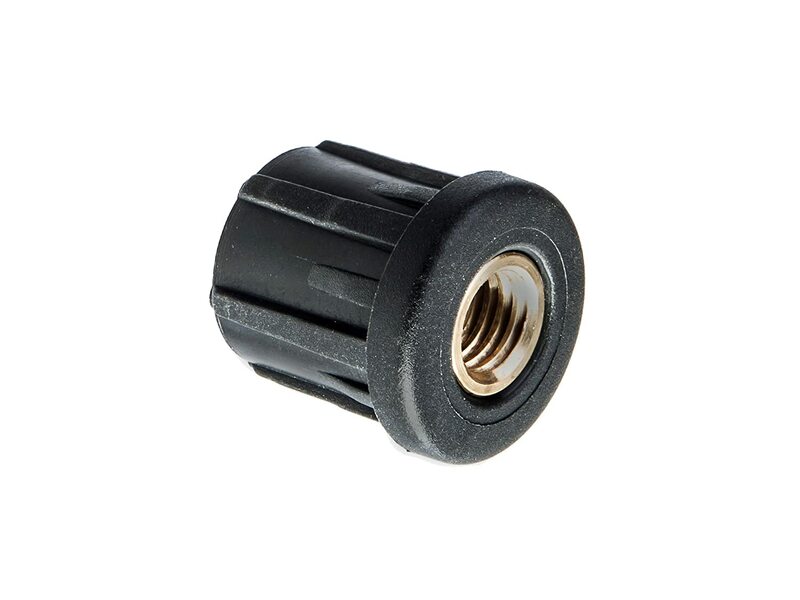 @DynaGlide - we hear you and will keep an eye on this thread to see what off-the-shelf solutions or suggestions show up - as well as indications of a wide interest in a currently un-available solution. The foam mats I've laid down help to level the floor a bit versus just having the tables on concrete. Once they sink into the foam they don't seem to move much meaning if I had a way to level the tables together better I think they'd find a natural center on the mats. .they'd essentially allow the tables to find their happy spot together. That would also be something I'd like to address. I took the feet assembly off two of my tables and the nylon part that is press fit into the leg wasn't even in the leg it was in the rubber foot. I fooled around with them for a bit, removed a bunch of grease, and have found they still don't really work all that well after inserting the nylon part back into the leg sans all the grease. I can adjust the table a very minuscule amount before it just sinks down into the foot. Without weight on the foot and the table on its side it seems the adjustment range was intended to be much greater. You can also turn the foot either direction as indicated by the arrows without weight but when it's under load it seems to only want to go one way and won't turn back. I think it's a crap design and I'd welcome an aftermarket solution that doesn't require modifying the leg (drilling/cutting). Even better would be a set of adjustable feet that work together on any of the legs as desired. I know the adjustable leg is longer than the other 3 non-adjustable but maybe something could be done? @TSO Products I appreciate the response. I realize this isn't something on your radar but I've seen it mentioned before that the MFT/3 table connectors need to be longer. They also present the issue of taking up the profile on the front of the table so if someone is using them and wants to slide clamps into that slot, i.e. for clamping plywood to the front of the table for edgebanding, they can't do it anywhere a table connector is located. My proposal is for a table connector that's say 48" long and sufficiently rigid that goes into the unused slot on the bottom of the profile serving two purposes: a more reliable connection of the two tables and one that doesn't take up valuable profile space on the front. 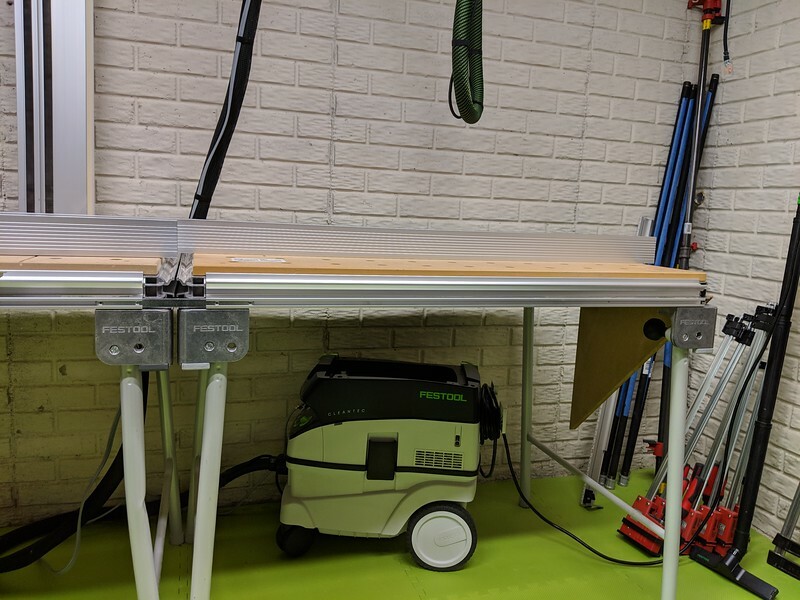 A longer table connector would give the added benefit of allowing you to space the tables apart such that there's a gap in between if you wanted to drop a router table insert, jigsaw cutting area, etc in between two adjoined tables, resting on the profiles and flush with the adjoined MDF surfaces. How often do you love your MFT tables? It would be far easier to build a cabinet or shelf system to set the MFTs on with the legs folded under or removed. I've considered that my problem with committing to something like a giant workstation is I'm still growing into this tiny space and I don't know what my needs will be 1, 2, 3 years from now and I'd hate to build something static that can't grow with the space. @DynaGlide - to be helpful I need to understand the the operation you want to accommodate on your worktable setup. Can you explain what parts and/or assemblies you are making? Is this a one-time project or an ongoing "business" need? @simonh and others: we hear you regarding the MFT "Foot" adjustability. We'll take a closer look at that. It might be something of sufficiently wide interest to develop an aftermarket solution. PS: - very nice clean looking shop environment! @TSO Products Moving forward this will be my assembly and cutting table. Having the tables better aligned would aid in case assembly. 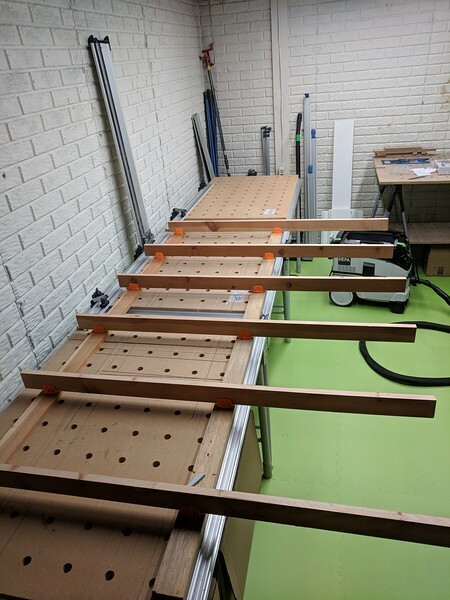 Additionally I'm working on a router sled and having the tables flush to each other would aid in setting up the rails for the router sled to ride on. Project wise I'm planning on doing several medium to large built ins over the next few years. @DynaGlide - we need to look around TSO to see if anyone here has a helpful suggestion or idea. We won't have a product or the ability to provide an affordable one-off solution to your challenge. and use this as adjustable feet, be sure to get them with swiveling feet, search for "Leveling Feet". Be sure to check sizing of the tube and math the thread diameter. For alignment you could easily make something like the rail connectors yourself, but longer. Just find the right size of steel or aluminium square rod, drill some holes, cut a tread and insert a bolt. @Hans Mertens - you're are right on target - THANK YOU. That should solve one of @DynaGlide 's problems. The swiveling adjustable feet are readily available in the US - we have used them as our standard approach when leveling equipment in our own shop. Whether a suitable plastic tube insert to fit MFT/3 legs tubing can be purchased in the US is subject to searching. I wouldn't add these to the MFT/3 legs, as it would increase the height of them - bringing them out of level with other stuff like a CMS or a Kapex on an UG stand (or MFT/Kapex). But these would be a good idea when building shelving to put the MFT onto with the legs folded, to have one level surface to put them all so you end up with them all being in the water. I have some on order arriving tomorrow from Mcmaster Carr. They might need slight modification to fit. I believe it will be shorter than the adjustable leg it replaces but with a long stud it should have a range of adjustment to get it back to factory adjustment range and then some. With the locking nut it won't budge, either, unlike the MFT cam foot. That adjustable foot looks the business but I am not sure it will help with your problem. Thanks for the picture, I still think your main problem is a floor that does not cooperate fully. I have also made display shelves around nine/ten feet with great success with only shimming - but that works as long as you can leave the piece resting on the mated MFT tables and not knock it around much. We are thinking of setting up a new workshop and I am planning on making a composite table the full length of a Corian or Staron board which is 3650mm (11.975 feet) which will be a pure assembly/outfeed table. I will keep an eye on this thread and should I get a eureka moment (but I doubt it) I will chime in again. I would add it to all four legs myself. Cutting the legs to keep the original height, if that's desirable. Don't forget to add/use a counter nut to keep the tables as stable as possible. I think these are all great ideas but why not fix the problem instead of trying to find a workaround. If the level of your workshop floor is so important why not level the floor with that liquid leveling concrete stuff? I have used the MFT connecting rods Festool offers, I believe they are different sizing than the connecting rods for the tracks. McMaster Carr has the metric parts you need. The leg/tube ID is 1.3" or 33mm which of course no one makes (that I could find) so I bought 1.375" ID inserts and used a razor scraper to shave it down until I could get it to fit. I now have a lot more adjustability and more importantly. .it stays where I adjust it. I laid some 90" @TrackTubesGuy profiles across the benches to show the gap, which is minimal. Before with the old foot I probably had 1/8" between the profile and the far right table whereas now there really isn't one. I might put these new feet on all the tables just because I like them so much. I don't think you could use them on the other non adjustable legs without cutting the legs. Thank you @Hans Mertens for the suggestion. 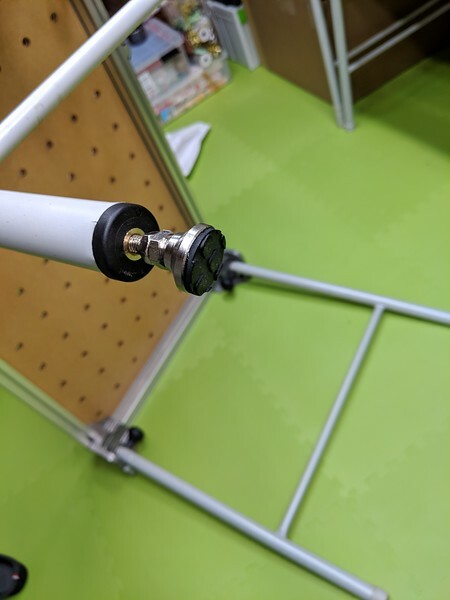 I would suggest putting bolting some aluminum angle under the extrusion by using the slot to hold the nuts you tie into. The angle would be much more rigid than anything you could put into the slot. The floor would still need to be addressed as you would want pretty much equal weight on all legs but the angle would encourage alignment and you could more easily see where the legs were not touching. The angle is pretty cheap and two bolts in each table per piece, or four per length of angle would make it quite monolithic. Edit: looking at the picture I think my suggestion is probably not practical as the festool corner is probably in the way. I would suggest putting bolting some aluminum angle under the extrusion by using the slot to hold the nuts you tie into. The angle would be much more rigid than anything you could put into the slot. Thank you for suggesting this, this will help me a great deal with only some slight modification (not spoken about here, of course).